Following the 2016 Presidential Election, first-time female candidate Emily Marburger attended the Million Women March in Washington, D.C. It was there she decided it was time to get more involved in local government, specifically in her hometown of Bellevue, Pa. Candidate Emily Marburger stands as she knocks on the door of a citizen of Bellevue. Photo by Victoria Bails. “Oh, I can be the person to do this,” Marburger said after looking into the candidates who were running for mayor and the description of what is required for a mayor of the small borough. Candidate Emily Marburger stands as she knocks on the door of a citizen of Bellevue. Just months later, Marburger launched her first campaign for mayor of Bellevue and began door-to-door knocking and setting up campaign events throughout the borough. On Tuesday, Nov. 7, Marburger’s hard work paid off as she won the election for Bellevue mayor as a first-time candidate. Before she thought about running for mayor, Marburger started a group called PGH for Progress to let people know of ways people can get involved in local neighborhoods and in local government. When Marburger considered running for mayor, she looked into both candidates and couldn’t believe they were running as democrats. The incumbent mayor, Paul Cusick, openly talks about voting for Donald Trump in the 2016 election. The other candidate, Tom Fodi ran as a republican for State Representative in 2014 and openly endorsed Gary Johnson in the 2016 election. Fodi marketed himself in the campaign as a “candidate for all” and wanted to see past party lines to appeal to all voters. Marburger looked into the description of the position of mayor and realized that she was qualified to run. Emily Marburger For Mayor from Victoria Bails on Vimeo. Marburger, who grew up in Saxonburg, Pa., and attended Knoch High School, graduated from Point Park University with a Bachelor’s of Art in Journalism and Mass Communication and Applied History. She received her M.B.A. in Management from Point Park University in 2012. For four years, she worked in a management position at First Third Bank assisting low-to-middle class families budget and raise their credit scores. After holding this position, Marburger left the bank to work for her father’s company, Upright Sprinkler Design. “This is a regular job where there’s flexibility,” said Marburger’s mother, Donna Marburger. Through this job, Marburger had a better schedule to help her with campaign efforts. In the Facebook group called “Pantsuit Nation,” Marburger announced that she would be running for mayor of Bellevue. The post got over 59,000 reactions and over 5,400 comments. Because of the post, she gained supporters from all over the country, including one in Hawaii who still sends her homemade pottery. “I would open up [Facebook], and I would have, like, 70-some new messages in the last hour. It was just random people from all over the country saying, ‘Good luck,’” Marburger said. Her campaign also gained national recognition when Marburger’s picture was featured on NBC News. The story was about another first-time female candidate Emily Brewer who ran for Virginia State Delegate as a Republican. Marburger’s picture was featured among ten other women who were running for public office for the first time. “It was just about how there was a surge in first-time female candidates,” Marburger said. While campaigning, she did different events like Coffee with the Candidates, sat in the playroom of McDonald’s to try to be accessible to more mothers in the community, Drag Queen Bingo fundraiser and participated in the League of Women Voters Forum. All of these events were done in an effort to try to attract different demographics within the community. 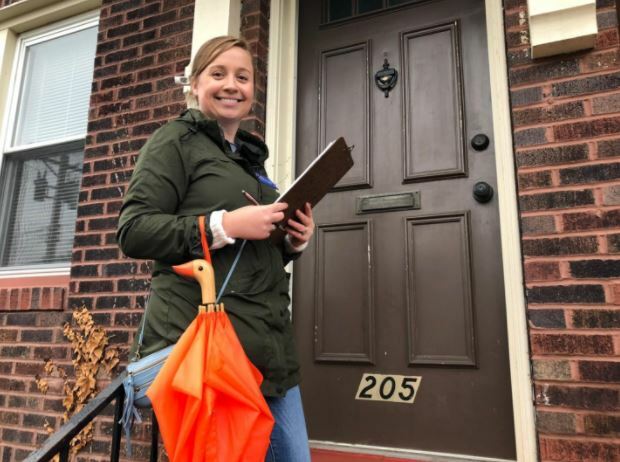 Besides events, the biggest effort Marburger put forth in her campaign was simply door knocking. To help cover the borough, Marburger had 25 people help with door knocking. Marburger spent months knocking on doors of those registered to vote in Bellevue. Marburger focused on both people who will likely vote and residents who voted in the presidential election but did not vote in the following primary election. Kelli Jones, a five-year resident of Bellevue volunteered on Marburger’s campaign. Marburger also had help with other aspects of her campaign. Natalie Roberson, Marburger’s yoga instructor, helped manage a lot of Marburger’s day-to-day social media pages. Molly Brown helped with Marburger’s campaign by door knocking and by planning out as well as acting as “home base” for a lot of events that took place during the campaign. Brown is married to one of the candidates Val Pennington, who ran for Bellevue Borough Council. Pennington and Marburger, as well as Michael Rajakovic, who ran for Northgate School Board, endorsed each other and all combined efforts to help each other campaign. Brown explained that all of the people who campaigned together were disappointed or furious about the outcome of the 2016 presidential election. “We just wanted to do something to change,” Brown said. The success of campaigning as a team showed when voter Jacob Singerling showed up to vote on election day. “Our connection to voting day, and really the only reason we came out, is because of Michael [Rajakovic] who is running for the school board position,” Singerling said. Ross Marshall also turned out to vote for Marburger on the day of the election. “I knew that she was a democrat, and I heard some things about Tom Fodi that I didn’t really agree with,” said Marshall. Marburger ran her campaign on economic development like streamlining the budget, supporting the police department, and start and manage activities and local groups for the youth of Bellevue. The main street of Bellevue is Lincoln Ave., which is the home to many businesses. With this plan, they would imagine starting a business and plan out where the optimum location would be for the business to thrive, what it would cost to bring it up to code, look at any zoning restrictions that would come up, look into demographics for marketing the business, and then reach out to investors to show them all of the research that has already been done for them. Marburger set up meetings with Bellevue’s police chief to familiarize herself with the department and see what improvements need to be made. Marburger began sitting in on ride-alongs with police officers. During the ride-alongs with the police, they would put up signs in the community for no parking and respond to suspicious activity calls. 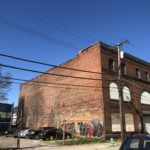 Marburger worked with a law student from Duquesne University to try to see what can be done about blighted property around the neighborhood and how to enforce codes more strictly. “A lot of people have complained that there is nothing for kids to do in this community once they leave school,” said Marburger. Because Bellevue is a walking district, the school districts are responsible for children from the time they leave school until they reach their homes. Because of the lack of space, not all kids can participate in the after-school activities. 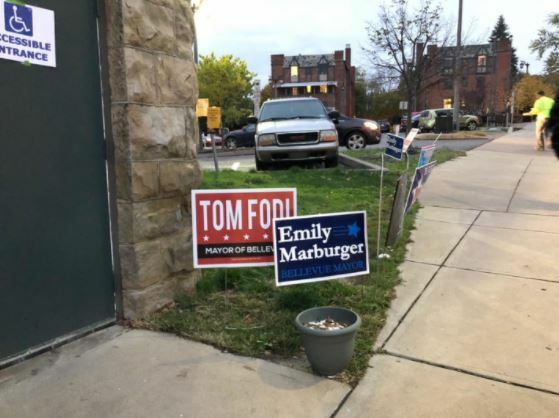 Candidate Emily Marburger and her opponent Tom Fodi’s signs were put at each polling location in Bellevue on Election Day. Photo by Victoria Bails. Candidate Emily Marburger and her opponent Tom Fodi’s signs were put at each polling location in Bellevue on Election Day. On Election Day, Marburger stood outside of one of six polling locations in Bellevue to hand out information on herself to voters. “Hi. I’m Emily Marburger, and I’m running for mayor,” Marburger said as she handed out her information card. After standing outside for 13 hours in the cold and sleety weather, Marburger’s opponent, Tom Fodi, gave her the unofficial news that she won the election. The candidates and their families stood together as they waited for the numbers to be posted on the Bellevue Boro Council Chambers. “Looks like I get to work with you as our next mayor,” Fodi said as he reached out his hand to shake Marburger’s hand. “I won,” Marburger said as she looked over at her parents in shock.